ANT+ in fitness is proven by more than 150k installations in fitness equipment. The FIT2 is an application specific and certified RF module. By Integration with a FIT2 module, a piece of fitness equipment links to the growing ANT+ eco-system. 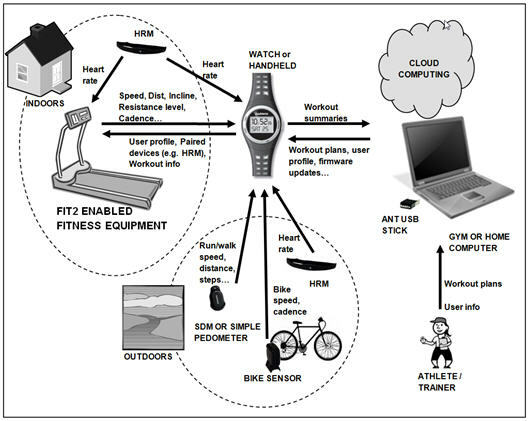 Through communication between Fitness equipment, watch / phone, heart rate monitor and other sensors, a user’s exercise data can be seamlessly displayed, stored, transferred and/or analyzed indoor and outdoor, on a console, a computer, a phone, a tablet and/or in the Cloud. The second generation of fitness module from Dynastream, the FIT2 is developed based on a proven ANT module platform and leverages the new enhancement of ANT wireless technology to address both the manufacturers’ and consumers’ needs.